Okay, that was heavy. Heavy, man. Points on readability shaved off by a few points, but hopefully I can manage through the entire thing. The shifting points of view tended to confuse, but I found that if I concentrated on Lola and her escapades, it wasn't so bad. And then of course, Lola just had to hang herself and die, so I'm left again with the confusing narrator. Which, from her stories, is one of Lola's roomies in their little university cube. From the blurb, we pretty much get the idea that there's a dictatorship/totalitarian regime that has taken over the society. I don't know the significance of the Party yet - is this like the "Party" in George Orwell's 1984? It's clear, though, that the citizens are oppressed. I agree that there's a haunting, misty landscape all over - haunting is the exact word I was looking for. The atmosphere felt heavy and dark, it's kind of depressing really. Heavy with themes, true. Add to that the grandfather and his barber, the mother who ties her child down to clip her nails, and the father who snip-snip-snipped at the garden plants. Who IS the child here? The political backdrop has become clearer in these pages, what with the mention of the “dictator” and his illnesses. I take exception to this because I found that I had to Google who Ceausescu (pronounced chou-shess-ku) was – since obviously the novel was set during his regime of terror. From what I read in Wikipedia, during Ceausescu's time, there was terrible poverty so much so that the administration had to create cover-ups: Ceausescu would visit a particular farm, where fat cows and sheep, and crops are imported from faraway places just to create the impression that everything is all and well. I mention this in connection with the stolen animal organs that Lola had to stash at the back of their refrigerator. Kurt, Georg and Edgar's friendship with our yet-to-be-named narrator is the thing that buoys her, I think, through their difficult lives. They are hiding notebooks and books by the well of a summerhouse, and it makes me think that they are into some kind of propaganda against the government. The circumstances are becoming more and more similar to 1984, I'm sure you'll agree with me. It has also become clear now that the child whose mother ties her down on a chair to clip her nails, whose grandfather plays chess against himself, whose father unceremoniously cut the plants in the garden, and whose two grandmothers – one who continues to sing and one who died – is our narrator herself. I find the letters – those written by their mothers to them as a result of the searches conducted on their houses, and containing their mothers' various physical illnesses, as well as those written by them to each other after they had gone from university – as a foreboding of things to come. I actually had to dog-ear the page which contains the code (nail-clippers = interrogation; shoes = search; cold = life in danger) because I knew these would crop up in the narrative before long. Speaking of barbers, I feel something portentous about the grandfather frequenting the barber shop. I even think it's a manifestation of his tenacity to live longer. I agree, Buddy. That was why our narrator's father insisted on a trip to the barber when he was discharged from the hospital – to die, she said, so she couldn't understand why he had to insist on that. There doesn't seem to be some solid political or radical action going on as far as the narrator is concerned, right? Or did I totally miss anything? think of more serious things. 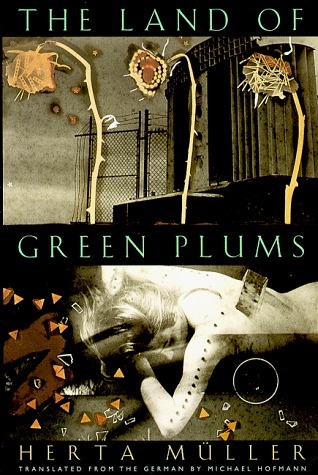 Green Plums by Joseph Decker. Photo courtesy. Tereza is an enigma to me. There was a part when our narrator gave the parcel containing the books and notebooks from the summerhouse to Tereza, saying something along the lines of: “Tereza took the parcel in trust, and I didn't trust her.” And then there was the part when they were walking along the street, and Tereza created a beast from the “antlers” created by the shadows of a tree. She told the story of how everyone – except two people – got frightened of the beast. Our narrator began to ask who those two people might be, and then changed her mind, but not without Tereza catching the moment's unease. Plus, Kurt warned our narrator about Tereza, counseling her that Tereza should not be trusted. I wonder who Tereza is in all this? Frau Margit, too, concerns me. She takes pains going into our narrator's room, presumably to poke into the latter's things, and she sure didn't appreciate Kurt's visits. She is devoted to Jesus, but she swears and burps on holy wafers. I highly doubt her loyalties. The seamstress who bought gold necklaces and shoved them up her privates is another thing. Considering the poverty and the situation in their country, I am at a loss as to why she would go through the risks of smuggling in gold just so her two children can wear something shiny around their necks. Oh, and Ceausescu finally makes that appearance (p. 134). Herr Feyerabend says “Ciao” is the first syllable in “Ceausescu,” which makes me think of all those fleeing people and their different plans of flight, which includes suicide. Isn't suicide also another way of escaping? The narrative doesn't follow a chronological timeline; instead, it see-saws between present, to future, and then past. This is why yesterday, we were given a glimpse of the fates of Kurt and Georg (they're going to die! ), and then the narrator hauls us back into the present, a time when she would often meet up with her boylets, each of them alive and well. In between narrations, our main protagonist would also be gripped by a memory from her childhood, and this is injected somewhere in the middle of a particular event. Our narrator has also divulged that Tereza will eventually die – 6 months from the time she visited our narrator in Germany (see, she fast-forwards stuff to when she was living in Germany, which simply means that she was able to flee) – and then goes back to the present, when they were all still in Romania. Tereza would turn out to be a traitor, after all. But I think she was compelled to do it by Captain Pjele – an incentive for having the nut under her armpit removed? For it wasn't mentioned in these pages how Tereza died – just the fact of her death and when it happened. I remember that when Tereza was made a member of the Party, the day (or was it after?) when our narrator was fired from the factory where they both worked, Tereza actually made japes before the assembly of Party members. This, despite the fact that her father is likewise a member. It makes me think that, true, Tereza betrayed our narrator, but it was done under compulsion, or in exchange for something beneficial to her. The noose would appear to be tightening against our narrator and her “boylets”; the surveillance seems to have been upped a notch. Even their families had to be dragged into all the mess. The accusations against our protagonists – that they are engaged in subversive activities – are getting out of hand. Our poor narrator, who had been dismissed at the factory and later, from the household where she had taken on the job of German translator/teacher, is also accused of being a whore. The chicken board toy that Edgar gave our narrator disturbs me because in the novel, they referred to it as the chicken-torture. Okay, I'm disturbed because from the way it was described (p. 155), I think it's the same toy that's being sold in Baguio, the ones made from wood, with a ball hanging on the underside. I bought one for my daughter during our recent Baguio trip. Anyway. The toy feels like a crude representation of our protagonists – each of them is a chicken made to peck at will, at the slightest movement of the ball or a tilt of the board upon which they are all mounted. The chickens had different colors, yes? One color to represent each person. They are like puppets that move only when made to, whose every peck is dictated by the action of the person that holds the board. Chicken-torture, indeed. My daughter has this toy, from Baguio. Photo courtesy. This last part is the culmination of the things that we were given a preview of in the first half of the book: the deaths of Kurt and Georg, and Tereza, too; the emigration of our narrator to Germany, and; the events leading up to it. We may have already been forewarned about Kurt's and Georg's deaths, but that didn't stop me from feeling sad - the friendship they shared was the only source of hope for them, especially during the time when they all felt that they were failures. The notebooks, the poems, the photographs they harbored and which earned them the attention and spite of Captain Pjele were just shared artifacts, symbols of that friendship. Never mind the subversive activities. Tereza did not earn my sympathy despite her medical condition and the lack of affection from her doctor-boyfriend. She was two-faced, a traitor, and in my book, they do not deserve sympathry at all. Our narrator is too kind to even have those inward debates over that love-rage relationship you mentioned. 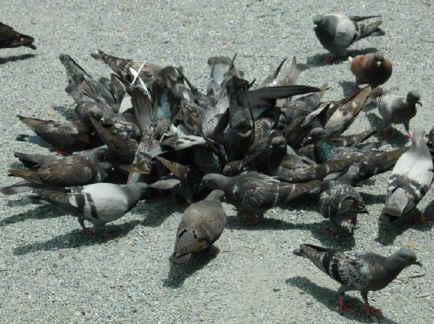 Also, pigeons - do correct me if I'm wrong, as I have very limited knowledge in ornithology - are birds that have that homing instinct - that ability to be able to find their way back to where their "home" is. I mention this in relation to what our narrator wrote in her letter-reply she sent to her mother when they had both successfully emigrated to Germany: that Romania is no longer "home", as other people have taken it already, and that where her mother is - Germany - IS "home".